Introducing a fun and very affordable way to plan an outing for you and your family or group. Located in Panama City Beach, Florida, is “Island Time” – a beautiful and sleek 50-foot long, 30-foot wide sailing catamaran. She is Coast Guard certified to carry up to 78 passengers. On our cruises you will enjoy a relaxing and fun sailing cruise with great music and a wonderful crew to make sure you have a great time. 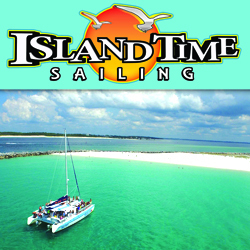 The Island Time has been the premier sailing catamaran in Panama City Beach since 1999. The proud and dedicated crew and staff of the “Island Time” have been with the company for years and are always excited to show off our beautiful natural resources. We sincerely hope you join us so you can experience the amazing activities our local waters have to offer. See why we love our jobs! The boat is equipped with two restrooms and a snack bar filled with lots of cold refreshments and tasty snacks. “Island Time” is also perfect for private charters, corporate outings, weddings, receptions, birthday parties, anniversaries, or just any excuse to get all your friends out on the beautiful waters of the Gulf of Mexico! For quotes on special rates give us a call or visit our Private Charters page.